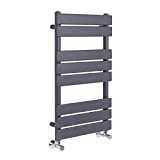 Heated towel rails are designed to keep your towels warm. They are also fantastic for drying your towels quicker after you have used them. This has many advantages and the most important one being that of hygiene. When a towel is dried quickly, there won't be any moisture around that bacteria can grown in. This will mean your towels will not have that musty smell most towels suffer from after being used. Apart from supplying you with warm clean bacteria free towels. 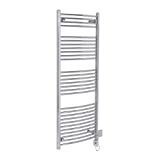 Towel rails can also be used to heat your bathroom. Along with a normal radiator they can provide the extra warmth that is needed during the cold winter months. 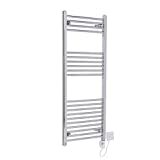 They can also be used on their own to warm up the bathroom without the need for a traditional radiator. This is however not the case for every heated towel rail available on the market. 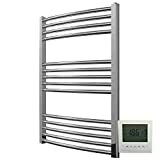 There are many factors that can affect whether a towel warmer will be sufficient to heat a bathroom alone. The first thing is the size of your bathroom. Obviously a big bathroom will require a more powerful heat source, so do not expect a towel rail to take care of a master bathroom. Another important thing is the output of your unit. Towel radiators just like other appliances have different settings and features. 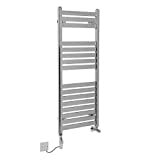 The output of a towel rail is measured in BTU or British Thermal Unit. The bigger the towel rad the higher BTU output it will have and therefore the more powerful it is and can produce more heat. 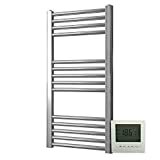 When shopping around for electric towel rails look for these measurements and try to get the unit with the highest BTU output you can afford. 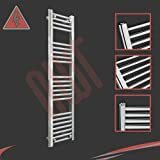 The rails will also do a more effective job in heating a bathroom if you do not have any towels on them when you intend them to warm your bathroom.